On August 23 3:00 am my sister and I were watching a movie, when all of a sudden our Rottweiler, which we keep in the bathroom at night, started barking uncontrollably, and soon after that, more neighbourhood dogs started to bark as well. My sister assumed that the dog must have wanted to go to the bathroom, so she took the dog outside. There she saw a very large object walking, and as it came closer into focus and became more visible, she knew, then and there, that it was too big to be a dog, but a wolf! It must have been at least 130 pounds. She immediately ran inside, shaking, and insisted that I go and look at it, so i did. And to my disbelief, it indeed was a wolf. But to make sure, I whistled at it and it didn't even seemed fazed by the noise, but instead kept walking. I went inside to tell my stepfather to go and look at it, but the wolf had disappeared around the corner. My stepfather was going to let our Rottweiler out after it, but I had stopped him because there was no way our dog would have won the fight, if one had broken out! The following morning we searched on-line to try and find the best match to what we had seen, and to make sure that we had really seen a wolf. Sure enough, the best match we found was a Timber Wolf. The picture on the computer of the Wolf showed that it had grey, white, and shading on it, just like the animal we had seen outside. Its head was big, too big to be the head of any dog I'd ever seen. We read description after description matching what we seen and there's no doubt that we really did see a wolf, in Wheatley Ontario. 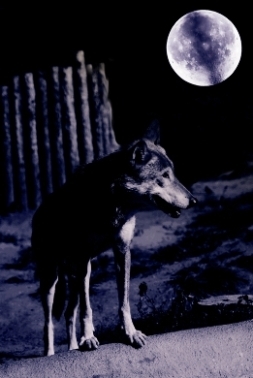 Wow, thank you Nicole, I wonder if any other readers have ever seen a Wolf in the Wheatly area?